Oh, where to start, where to start . . . . Assuming you've even scrolled down past that, uh, picture (and I can't blame you if you don't), I'll bet you wanna know what's . . . going on. Well! This started with my sister and I bored on the subway in Washington D.C. (called the "Metro"), and she was saying that if Kenpachi "Jingle Bells" Zaraki would take up two seats of the Metro and there was this old lady scared of him, wouldn't that be great ha-ha. So I was telling a friend of mine about this as I was drawing it, and I said I wanted to put some other Bleach characters in there, and somehow that turned into Ichigo with hot pants. That was all her. I swear. And then, naturally, Ishida had to be in there, and he's a doctor ('cause his dad . . . yeah). And then we wanted Rukia in there but we decided on Byakuya instead, because he's got these hair decorations, and it was funny at 2 in the morning to make him the weirdo with things on his head. And if you have not seen the Bleach art book scans, you are really missing out, 'cause there's a picture (canon, now!) of Hitsugaya's gigai in a trash can. But he also serves to balance out the composition! Yes! I actually thought about that kind of thing while making this! 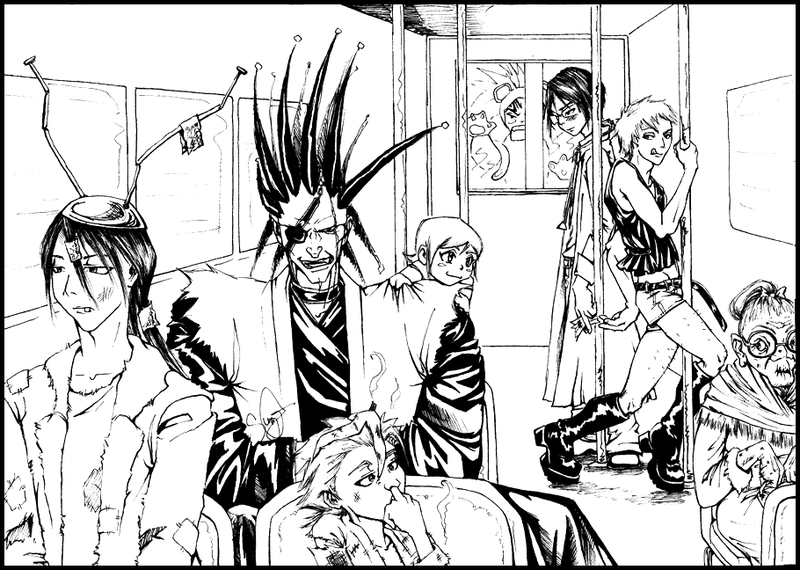 Oh, and yes, that is Renji plastered to the back of the Metro in a monkey suit. Bleach+Metro=Bletro, I defy all laws of perspective and subway car floor plans and people size ratios, this is crack!art and not to be taken seriously kthankscomeagainsoon. *Thumbs up! It's in Volume 23 or 24, I believe. So it should be released by VIZ pretty soon! he looks like he's enjoying himself though. Thanks! Maybe I should go put my inking skills to better use, lol.